Blocks – are when you are unavailable for teaching; it might be a regular private lesson or a one-off doctor’s appointment. Any blocks you have are listed here. 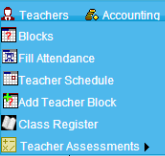 You might want to check that the blocks are still valid as School Admin cannot give you lessons if the system thinks you are unavailable. See below on how to create blocks. Fill Attendance – this is another way to put attendance into the system. It is explained in full here. Teacher Schedule – this contains what the system has for you in terms of lessons and blocks. Select the month and year you want. You can also print this out.